Few SUVs have successfully refined the combined formula of powerful performance, dynamic utility, and impeccable style better than the Toyota RAV4. 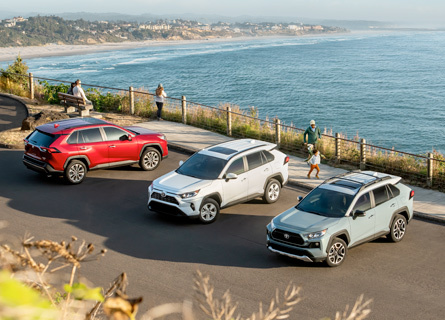 This year, the RAV4 receives one of its biggest redesigns to date, making it one of the most versatile, fuel efficient, and advanced models to date. At the same time, you still get everything that made the RAV4 an excellent vehicle, likes its spacious and comfortable interior, plus added features that further enhance it ahead of the competition. Take a look at what the all-new Toyota RAV4 has to offer, here at Tri-Mac Toyota! For 2019, the RAV4 is all-new, completely redesigned, and as excellent as ever. For starters, it receives a new 2.5 litre, 4 cylinder engine that produces 203 horsepower, boosting it up by 27 hp compared to last year’s model. On top of that, it also receives a new eight-speed automatic transmission and a lighter curb weight that further improves the performance of the RAV4. Outside of performance, Toyota Safety Sense 2.0 is now standard across all models, as well as the incredibly intuitive Apple CarPlay™ to give you the best smartphone experience with your iOS device.